But desperate times demanded desperate action. The promise of a just peace was too powerful for the Kaiser’s government to ignore. The German offensive from March to June 1918 is said to have pushed the allied armies on the Western Front closer to disaster than at any time since the first battle of the Marne in 1914  but this last throw of Ludendorff’s dice was frustrated by “the enormous acceleration of the arrival of American troops.”  Like exhausted prize fighters who had fought to a standstill, the Allies and Germany stood in their corners feigning a readiness for the next round. But while Britain and France had almost limitless reserves on hand from America, Germany was truly spent. Wilson’s Fourteen Points appeared as the basis for a just and honourable settlement. It was a triumph of deceit over justice. 1. Report of the Committee of Prime Ministers. Preliminary Draft. appended to the minutes for the Imperial War Cabinet 32B, 16 August 1918. p. 167. Like magicians, Secret Elite historians created the illusion of war’s end in November 1918. It was over, that war to end all wars. Or so they would have us believe. Consequently, one hundred years later we have been successfully drawn into the myth that the First World War was fought between August 1914 and November 1918. Students are still taught that the First World War came to an end when an Armistice was signed in Marshal Foch’s railway carriage in the forest of Compiegne in Northern France on 11 November, 1918. Though the guns fell silent at 11 a.m. that day, and the historical strap-line that the First World War raged between 1914-1918 remains carved in stone, war against Germany continued well beyond that date. The brutal war to destroy her absolutely had been deliberately started in 1914 and unnecessarily prolonged beyond 1915 by the hidden powers in Britain backed by their American allies. Consequently, they had no moral qualms about continuing the disintegration of German society after the armistice had been signed. 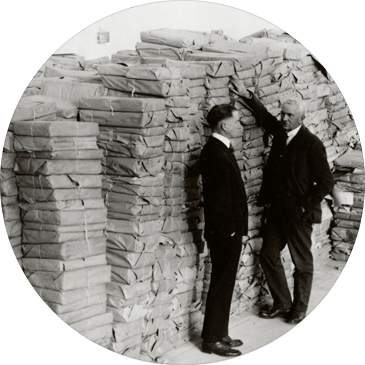 The instrument through which they acted was, ironically, the continuation of the tightly controlled blockade on German imports of food and other supplies essential to the civilian population. 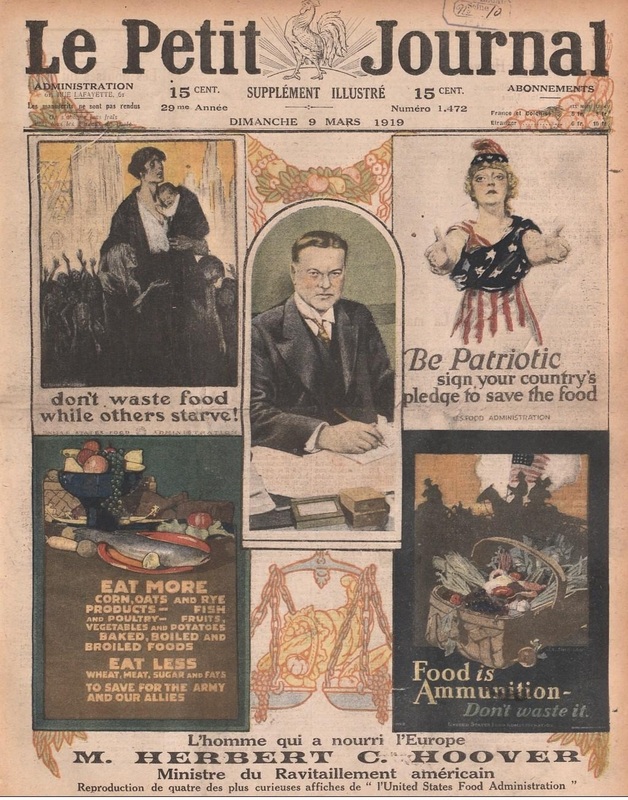 The very act that would have ended the war in 1915 was ruthlessly applied after the armistice had been signed and caused widespread starvation and death in Germany and Austria throughout 1919 and beyond. It might be some consolation if the establishment’s denial of this historical fact embraced a sense of guilt or embarrassment which clashed with the myth that the Allies continued the war to save civilisation. Not so. Such sentiments never found sway with Imperial Britain’s ruling class. Their tactic is not to apologise, but to ignore. If the people grasped the appropriateness, politicians like Lloyd George grasped the opportunity to focus public attention on a memorial and deflect scrutiny from the truth about the war. 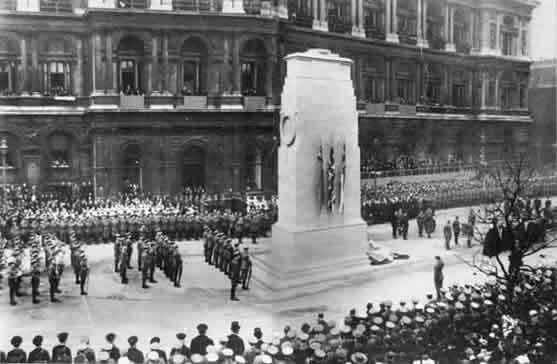 On 11th November 1920, King George V unveiled a permanent stone memorial in Whitehall. 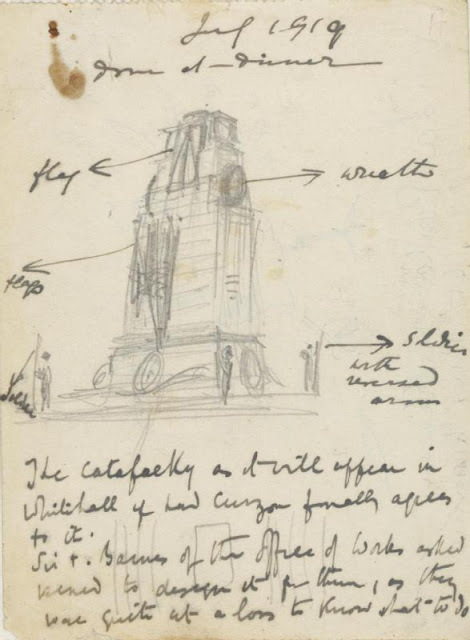 Lutyens called it a “Cenotaph”, which broadly translated from ancient Greek as an “empty tomb”, built at the centre of government administration to honour those buried elsewhere. It was a masterstroke of lasting propaganda. Remembrance Day services continue to be observed annually at war memorials in every village, town and city in Britain on the Sunday closest to that date. Remembrance is more than important. It is vital. But we must clarify what should be remembered. The great lie of November 11 is matched by the lies on those war memorials that Britain and her Empire fought in a bitter struggle to save the world from evil Germans; by the lies that millions of young men willingly laid down their lives or were horribly maimed for the greater ‘Glory of God’ and to secure and protect ‘freedom’ and ‘civilisation’. In reality, they were sacrificed; they were the unwitting victims who died for the benefit of the bankers and financiers, the secret cabals and power-mongers on both sides of the Atlantic. Remembrance is sullied by the triumphant militarism which attends these services led still by royalty, religious leaders and the political class. The subliminal message mocks Wilfred Owen’s anti-war poem, ‘Dulce et Decorum Est’. The great lie is perpetuated; violence is seen as a means of resolving disputes while the horrors, realities and true causes of war remain buried deep. Be assured, no matter the hypocrisy that surrounds Remembrance Day, war did not end with the Armistice. That is merely one of the many lies about WW1 which are still peddled as fact. Though fighting on the Western Front came to a standstill, the assault on German men, women and children continued unabated. Indeed, it became ever more extreme through a ruthless and cynical continuation of the blockade on all food supplies to Germany. What followed were the famous Fourteen Points by which President Wilson defined the new world into which all would be peacefully transformed. These included an end to secret treaties, the absolute freedom of navigation on the high seas, free trade and the removal of economic barriers and absolute guarantees that nations would reduce their armaments to the bare necessities of self defence. The sovereignty of small nations and subservient colonies was to be determined through a balance of rightful claims and self-determination. Sympathy and support for Russia’s political development was expressed in a plea that she be welcomed into the ‘society of free nations’ and that Russia be given every assistance in determining her own future. Belgium merited special consideration. Her sovereignty as a free nation was to be clearly asserted and Germany had to withdraw from Belgian territory to restore confidence in justice and international law. Alsace and Lorraine, former provinces of France which had been ceded to Germany after the Franco-Prussian war in 1871, were to be ‘freed’ and the invaded portions restored to France. 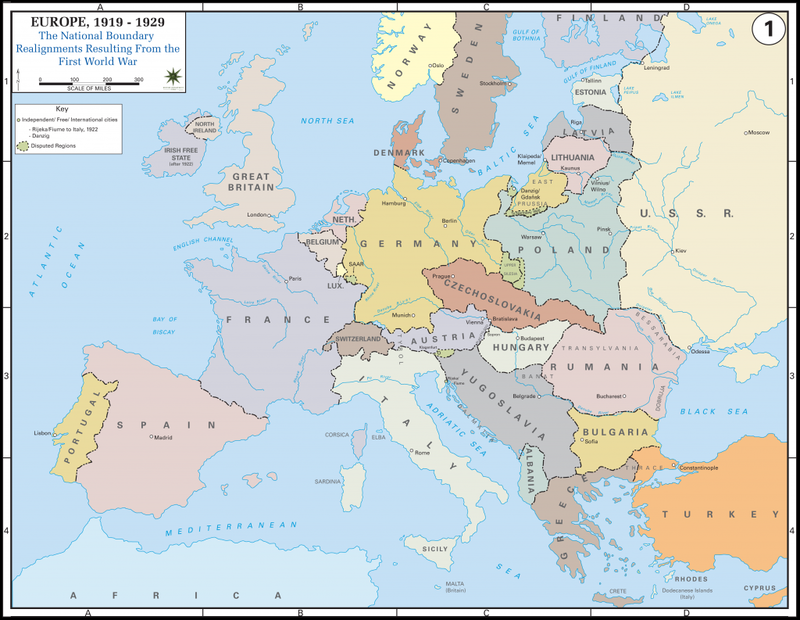 Detailed readjustments to Italy’s borders, safeguards for the peoples of Austria-Hungary, territorial agreements for the Balkan states and the ‘Turkish portion of the Ottoman Empire’ and an independent Poland were all included in Wilson’s grand statement. Words like assurance, integrity, guarantees, autonomous development and rightful claims gave the Fourteen Points an implied sense of natural justice as did the final ambition of a ‘general association’ of nations for the purpose of affording mutual guarantees of political independence and territorial integrity to great and small states alike’. The President appeared to have conjured a solution to the world’s problems. It was a mirage, not a miracle. 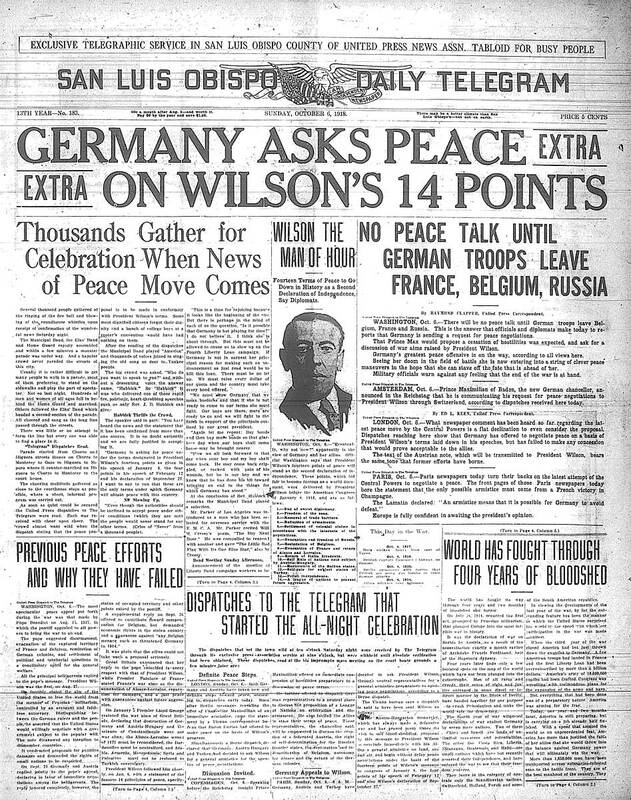 Max von Baden’s telegraphed message was forwarded to the U.S. President on 5 October 1918,  as was a similar peace overture from Austria-Hungary,  but Wilson said he would not negotiate as long as the German army remained on foreign soil. 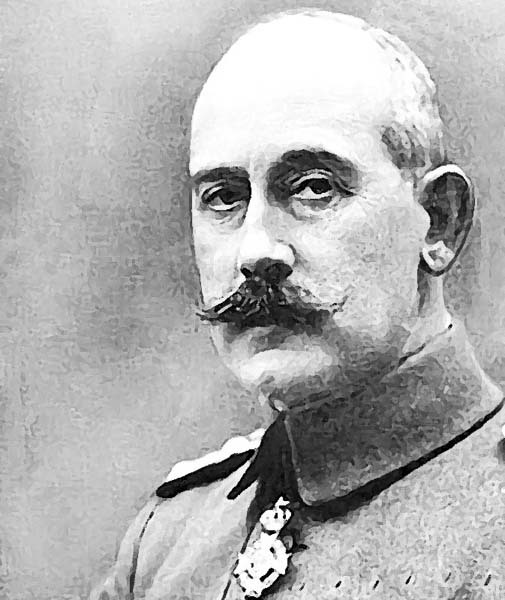 He stated that the good faith of any discussions would depend on the willingness of the Central Powers (Germany and Austria) to withdraw their forces everywhere from invaded territory, though the President did not stipulate a deadline. What followed was totally devoid of good faith. Ellen Leslie MA GradDipCons (AA) in blog: BUILDING STOREYS, posted on Sunday 11 November 2012. 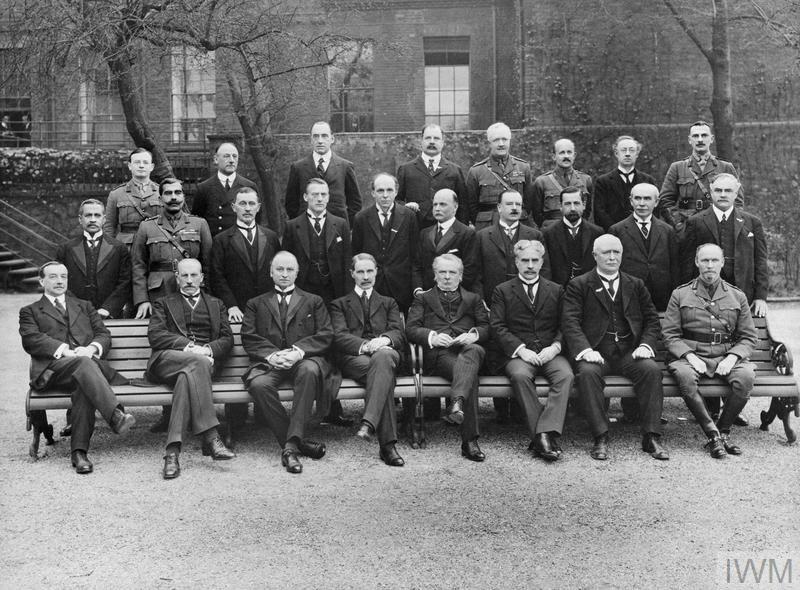 The Imperial War Cabinet comprised the prime ministers of Britain, Canada, Australia, New Zealand, Newfoundland and South Africa, represented by Jan Smutts. Minutes of the Imperial War Cabinet, 32B, August 16 1918, CAB 23/44A/13. Ex-Kaiser William II, My Memoirs: 1878-1918, pp. 268-9. President Wilson’s Message to Congress, January 8, 1918; Records of the United States Senate; Record Group 46; Records of the United States Senate; National Archives. There are many sources for the exact wording. The Yale Law School site at http://avalon.law.yale.edu/20th_century/wilson14.asp can be accessed at this address. C. Paul Vincent, The Politics of Hunger, p. 61. David Lloyd George, War Memoirs, vol. 2, p. 1934. The Times, 10 October 1918, p. 7. Robert Lansing to Swiss Charge d’Affaires at Washington 8 October 1918. 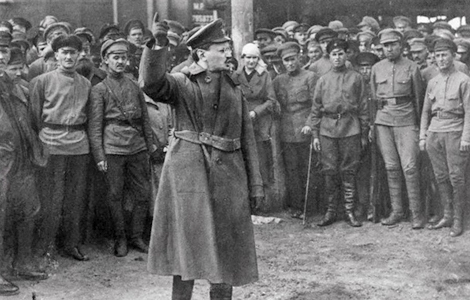 The Russian Revolution began on 22 February, 1917 (O.S.) as a direct consequence of the actions of workers leaders at the massive Putilov armaments factories in Petrograd. Portrayed as a spontaneous and leaderless uprising of the downtrodden and oppressed proletariat, it was nothing of the sort. 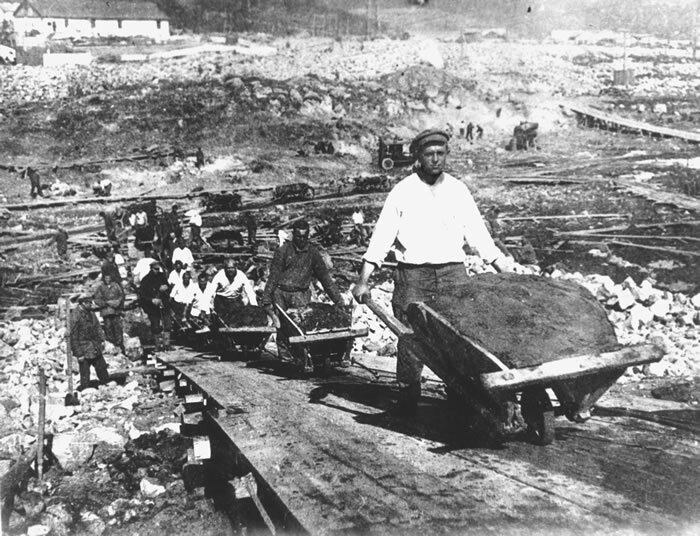 Workers’ leaders at the Putilov munitions works and other major industrial concerns in Petrograd, were bribed to stir up industrial and civil unrest. At the Putilov factories they led some 30,000 workers out on strike after an angry and bitter tirade against the management over low wages. 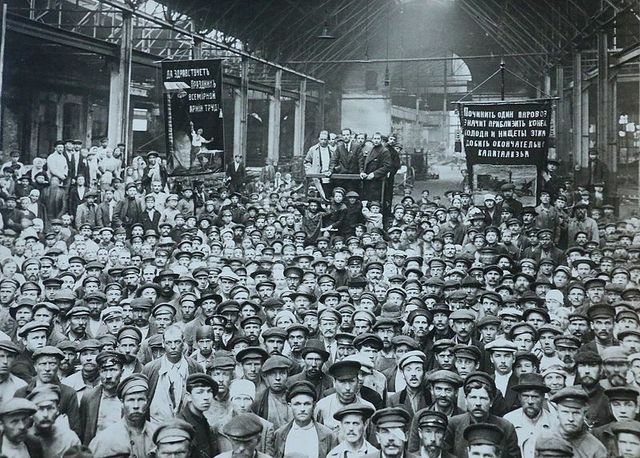 In the following days, workers at other factories across the city were similarly stirred to action, and encouraged to strike in support of the Putilov workforce. On 22 February, management at the great armaments works locked the factory gates. Were they were forewarned of possible sabotage? It was widely known that 23 February was International Women’s Day and that tens of thousands of women, many of whom were war widows or the wives of soldiers who had been badly wounded at the front, would march in protest against the war. 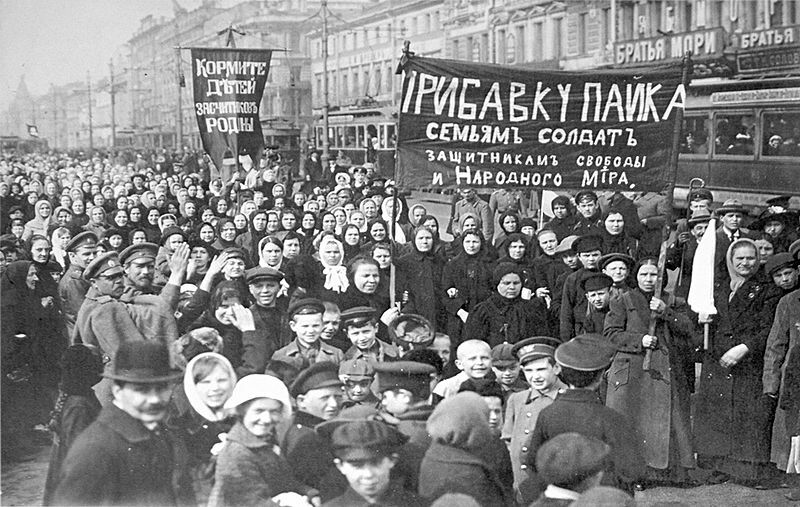 The Putilov workforce joined the women on the streets along with 90,000 other workers. Mass crowds paraded through the city protesting about food shortages, calling for an end to war and the overthrow of the monarchy. The following day numbers on the streets rapidly snowballed. Shop windows were smashed and hungry protestors helped themselves to bread. 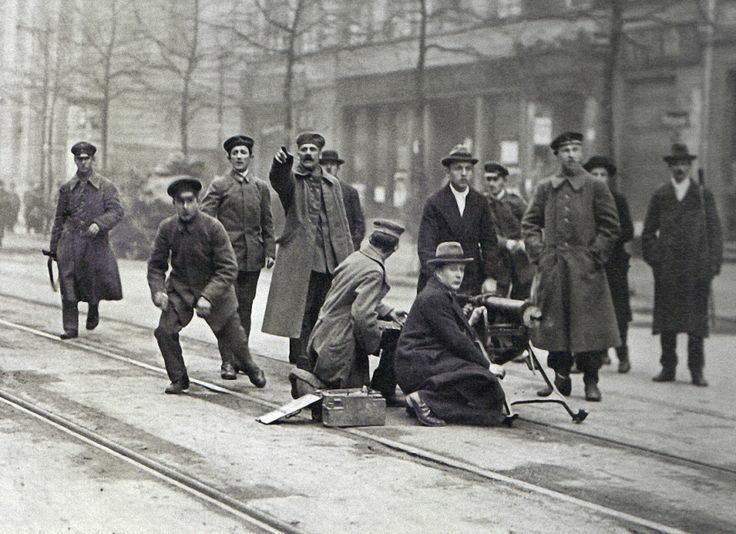 The Petrograd police shot several protestors, but were themselves, completely overwhelmed. Just before Petrograd ‘spontaneously’ erupted, the British ambassador, Sir George Buchanan took himself out of town, ‘safely withdrawn from the scene of a tumult that he had contributed to kindle’. It was an old ruse. Czar Nicholas II was some 500 miles away in Belarus in his role as Commander-in-Chief of the army. On 25 February, around thirty of the workers leaders met at the Petrograd Union of Workers Co-operative to set up a Soviet. On Sunday 26th, the Czar ordered a military crackdown. Forty, perhaps fifty, protestors were shot on the streets by troops from the city garrison, but there were increasing reports of desertion as disillusioned troops joined forces with the demonstrators. With exasperation bordering on despair, Rodzianko, raised the level of anxiety in a second telegram on 27th February: ‘The situation is growing worse. Measures should be taken immediately as tomorrow will be too late. The last hour has struck, when the fate of the country and dynasty is being decided. The government is powerless to stop the disorders. The troops of the garrison cannot be relied upon. The reserve battalions of the Guard regiments are in the grips of rebellion, their officers are being killed. Having joined the mobs and the revolt of the people, they are marching on the offices of the Ministry of the Interior and the Imperial Duma. Your Majesty, do not delay. Should the agitation reach the Army, Germany will triumph and the destruction of Russia along with the dynasty is inevitable.’  Nicholas read the telegram, made a derogatory comment about Rodzianko, and remained at the Front … for three short days. On 2 March 1917, (O.S.) 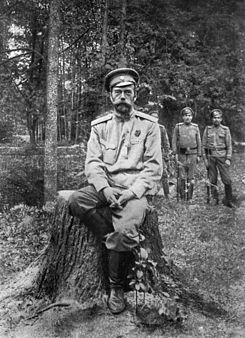 Czar Nicholas II abdicated, initially in favour of his 13 year-old haemophiliac son, Alexei, but quickly changed his mind to favour his brother. Grand Duke Michael declined. He was a realist. 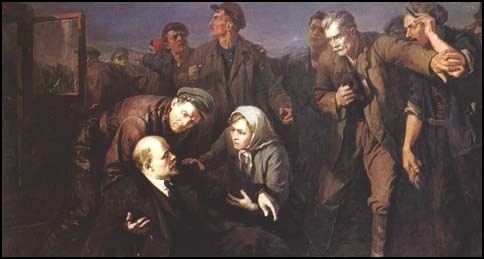 Whatever the truth, Lenin was said to have known that Michael had been in favour of the February revolution and ‘had even worn a red ribbon in his buttonhole’. The Czar caved in without any meaningful fight and Romanov rule came to an abrupt end after 300 years. Received history recounts that he abdicated because he had lost the loyalty of his army, but was this put to the test? Though he announced that he would stand down in the interests of the military, he privately recorded in his diary that: ‘All around is betrayal, cowardice and deceit!’  He meekly surrendered the imperial throne, yet Rodzianko had clearly stated that the mob was marching on the Duma, not the Czar. He still commanded the army. Rodzianko warned that ‘should the agitation reach the army’ Germany would win the war. The army in the field stood loyal. So who had betrayed and deceived the last Czar? What had been whispered in his ear? What role had Alfred Milner played in the Czar’s decision to abdicate? What warnings or indeed assurances had been given during his private meetings with Nicholas II just weeks earlier? As we have shown, the evidence points to Milner’s certain knowledge of what was about to take place before he had even departed Russia, although, once home, he tried to cover his complicity by making a clear statement to the contrary for public consumption. Had Nicholas been promised sanctuary in Britain, as he had previously been promised Constantinople? On Nicholas II’s abdication, a provisional government was immediately cobbled together. Most of the chosen ministers were liberals from the previous Duma with a sound basis of support from the middle classes. They sought to establish a capitalist democracy similar to Britain and, most importantly, supported Russia’s continuation in the war until Germany was defeated. Of all their actions this was the key to support from Britain, America and the other Allies. News of the revolution and abdication was greeted in London with satisfaction by Prime Minister Lloyd George. 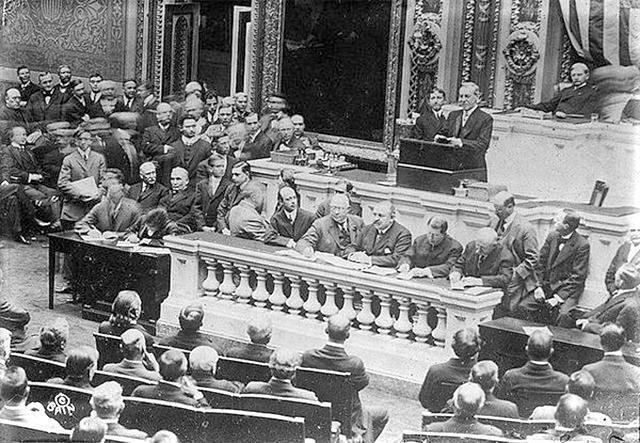 Across the Atlantic President Woodrow Wilson, spoke to Congress about ‘those marvellous and comforting events’ in Russia, where ‘autocracy’ had finally been struck down. Did the Czar ever ponder that while he had talked about making peace with Germany he had been replaced with a government which promised to continue the war; the unpopular war; the debilitating war? The speed with which the British government distanced itself from the Czar might be considered breathtaking, unless of course you are aware that the Secret Elite had sanctioned his removal. They were advised and updated by ambassador Sir George Buchanan and Sir John Hanbury-Williams  head of the British military mission to Russia. Both men represented the Secret Elite’s interests. 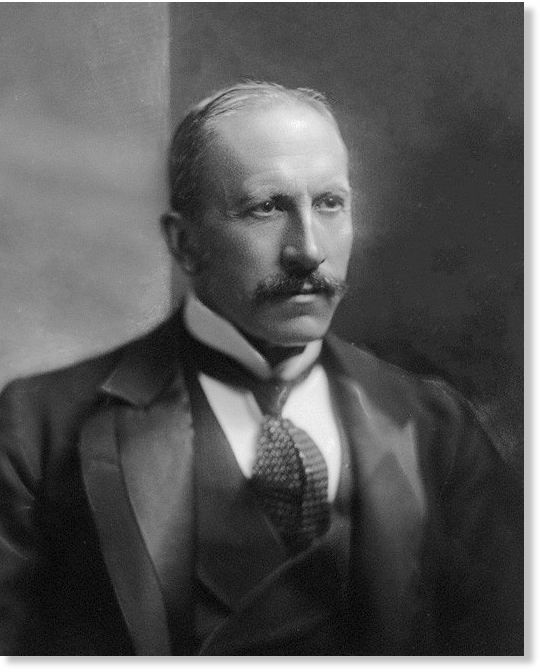 Buchanan was a foreign office fixture and Hanbury-Williams’s connection with Alfred Milner dated back to the Boer War where he served as Milner’s right-hand man and Military Aide de Camp. The British War Cabinet decided to present a resolution to parliament ‘sending paternal greetings to the Duma, heartfelt congratulations to the Russian people’ and praise for their ‘renewed steadfastness and vigour [in] the prosecution of the war against the autocratic militarism which threatens the liberty of Europe.’  What? Was irony dead? For whose consumption was the notion that the Russian people, who had been subjugated to Czarist autocratic militarism for three centuries, wanted to continue the war against the alleged autocratic German militarism reputedly threatening Europe? These Secret Elite agents were shameless. They not only abandoned the Czar without hesitation, but instructed Hanbury-Williams to stay away from him or any member of the royal family so that Britain’s good relations with the Provisional government would be seen as more important. Discussion on the Czar’s future concluded with the decision that ‘they were in doubt as to whether Great Britain was the right place for him to go.’  He had been deeply unpopular in Britain before 1914, despised by the Jewish communities, the socialist and trades union organisations and fair minded liberals. Others questioned the advisability of the Czar seeking refuge in any neutral country where he could become the centre of intrigue, so the War Cabinet changed its mind within 24 hours. In theory the Imperial Royal family might have found refuge in Britain. He never did. But consider what really mattered to the British Elite. The Czar was instantly abandoned and no more mention was made of promises like Constantinople, false or otherwise. Both were filed in the past tense. Gone. 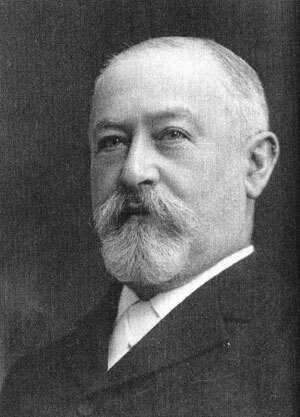 Prince George Lvov, with whom Alfred Milner had spoken some weeks earlier, was named as the first post-imperial prime minister of the provisional government. Co-incidence? Hardly likely. Alexander Kerensky, a Menshevik, was appointed minister of war and navy. The new government, plagued with factional infighting and competition for authority, underwent several changes over the following months. The Bolsheviks had little influence on the seismic events of February/March 1917 or the new government. They were a tiny faction which had effectively been neutered by the enforced exile of their key leaders. The Mensheviks, if anything, fared worse. They ‘almost entirely disintegrated and became indistinguishable from other ‘progressives’, combining a patriotic attitude towards the war with a demand for ‘democratic’ reforms.’  But the provisional government served its purpose for the interim period. The bankers and financiers from Wall Street circled above a fatally wounded Russian bear, salivating at the prospects of wondrous profits to come. 1. Guido Preparata, Conjuring Hitler, p. 29. 4. Dimitri Volkogonov, Lenin, Life and Legacy, p. 106. 6. Preparata, Conjuring Hitler, p. 29. 8. National Archives FO telegram 514, dated 19 March 1915, and the reply FO telegram 514 dated 20 March 1917. 9. CAB/23/2 WC 100, 21 March 1917. p. 4. 11. CAB 23/40/2, WC 101. 22 March,1917. 12. E.H. Carr, The Bolshevik Revolution, p. 67. In a sense it was Gallipoli all over again. Hold the Russians fast to the war without allowing them to gain anything from their mammoth contribution. Until the United States entered the war and her troops were on the ground in Europe, Russian troops were valuable, but Russia could not be allowed to share the spoils when the ultimate victory had been secured. It was absolutely essential that the Czar be prevented from mounting a successful offensive in 1917. 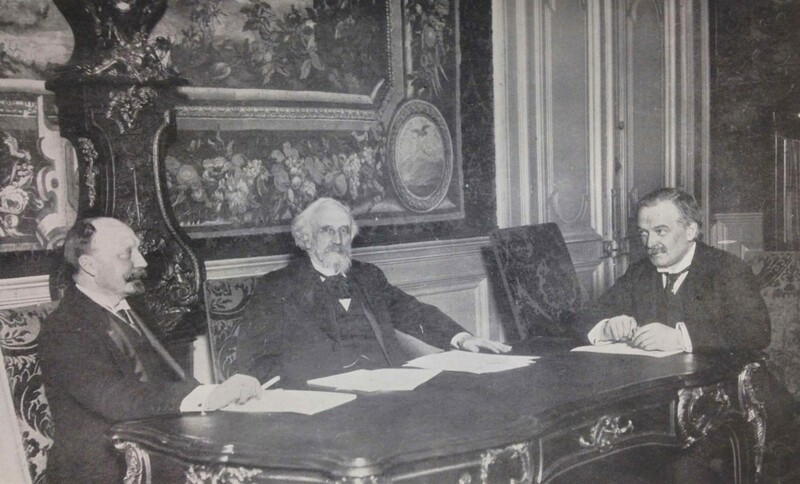 An Allied conference in St. Petersburg was hastily arranged, theoretically to discuss the proposed offensive, reach an agreement to supply vital armaments and boost local morale. Step forward Alfred Milner, undisputed master of the Secret Elite, to lead the British delegation. According to Cabinet papers, Milner was ‘authorised to give assurances on supplies to Russia if in his estimation the Russians could make good use of them’. What power. Armament supplies to Russia were crucial to the proposed offensive, yet Milner was given personal authority to decide whether or not Britain would supply them. In his hands alone lay the power to determine whether the war would end in the summer/autumn of 1917 or continue beyond. If artillery was not provided, Russia’s summer offensive and consequent victory was a lost cause and the Czar’s fate sealed. 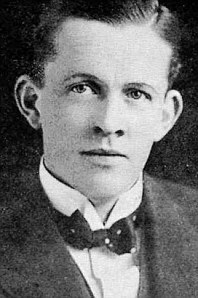 Alfred Milner and the British delegation sailed from Oban in Scotland on January 20, 1917. According to Bruce Lockhart, British Consul in Moscow, ‘Rarely in the history of great wars can so many important ministers and generals have left their respective countries on so useless an errand’. 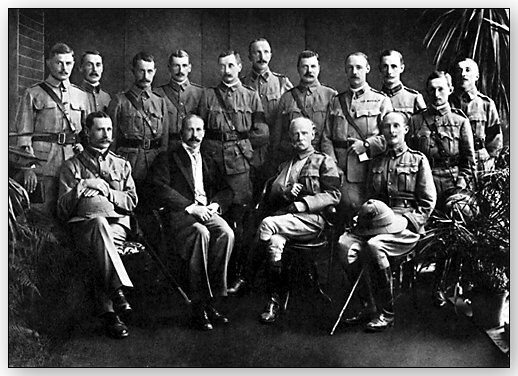 The British Mission was the largest with Lord Milner, his political advisers Lord Revelstoke (a banker) and George Clerk, together with his military advisers Sir Henry Wilson and five other generals. The French sent one politician and two generals, the Italians a politician and a general. Why was there such a ridiculously heavy presence of generals in the British delegation? The role of General Sir Henry Wilson, who was closely linked to the secret cabal, was to give military approval to the final decision. Wilson hung on Milner’s every word and would never have contradicted him. In turn, few if any British generals would have dared contradict General Wilson. They had discussions with senior members of the Russian armed forces, but the Generals were said to be decidedly under-impressed. It was, apparently, ‘a useless errand’ just as the British consul had said, but in reality the real mission to block any Russian chance of gaining Constantinople worked perfectly. 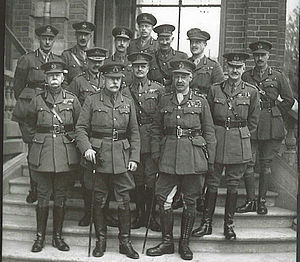 Milner undertook the long, dangerous journey (Lord Kitchener had been killed on a similar voyage from Scotland to Russia in 1916) despite being advised not to go by a fellow member of the Secret Elite, Lord Esher. On the day he arrived in Petrograd, and before he had even met or discussed the armaments proposal with the Russians, Milner made no attempt to conceal his doubt. From the very start he used ‘the inefficiency of the Russians’ as an excuse to turn down their request for artillery. He held several meetings with the Czar, and held nothing back. Lord Milner warned Nicholas II that if Britain was to hand over her vital heavy guns, it was necessary for Russia to prove that her own supplies were exhausted and be absolutely assured that Russia could defeat Germany in the proposed military operations. Milner added bluntly that it had come to his notice from many independent, ‘well-informed sources’ that Russia had failed to fully exploit her manpower and her own vast resources. Milner promised Nicholas II nothing. On 3 March 1917, he arrived back in London and informed the government of his decision: No guns for Russia. Three days later his formal report to the War Cabinet about the events that took place at the Allied Conference in Russia was dismissive. He felt that too many unnecessary people had attended, ironic, considering the size of the party which accompanied him, and too many personal and distracting agendas had been aired. In-fighting amongst the Russian military leaders was seriously debilitating. 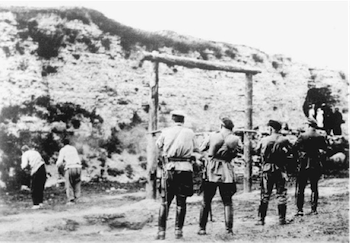 Milner claimed to have been shocked by the lack of training in modern weaponry which Russian soldiers had been given. Organisation, he deemed, ’chaotic’. He stated that the Russian government under the Czar was ‘hopeless’ and improvement unlikely, but in his view there was ‘a great deal of exaggeration about the talk of revolution’. He specifically denied that an impending revolution was likely. Such an astonishing assertion requires further examination. Why, if the armed forces were in chaos, did he think that a revolution was unlikely? 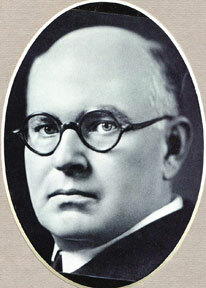 Milner made a verbal report to a War Cabinet which included the prime ministers of Canada and New Zealand. All the Secret Elite political agents were present. No minute was taken  (a very unusual but convenient occurrence) and whatever was said, we will never know. His written memorandum for Cabinet (dated 13 March) that there would be no revolution, was signed 5 days after the uprising started. To imagine that the foreign office did not know this, or even that Milner could not have altered the wording of his report, is ridiculous. It was a calculated comment; one meant to deflect attention from his unreported discussions with other parties. Lord Alfred Milner knew exactly what was about to happen in Petrograd at that precise moment in time because the Secret Elite was instrumental in facilitating it. 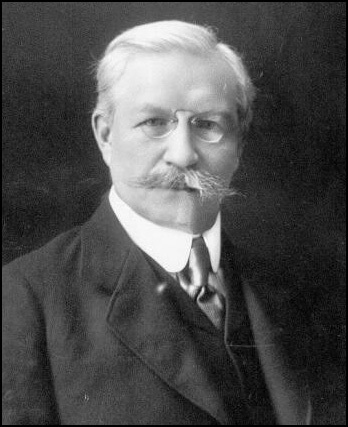 Bruce Lockhart, the British Consul in Moscow, was shocked when told of Lord Milner’s conclusion that there would be no revolution. He suspected that the foreign office had prepared a false report, insisting that there was nothing in Milner’s attitude or discussions during his visit to indicate that he had any confidence in the Czar. Nothing. Milner’s report had been concocted in conjunction with the Foreign Office to delude his contemporaries, and doubtless later historical researchers. In his War Memoirs, Prime Minister Lloyd George bemoaned the fact Milner and his entourage had not apparently grasped the immediate seriousness of the situation: ‘Having regard to the warnings which were blaring at them in every direction, it is incomprehensible that they should have been so deaf and blind.’  Milner was neither blind nor deaf. As ever, he lived with the criticism which covered his actual purpose. He had always disregarded the screamers. 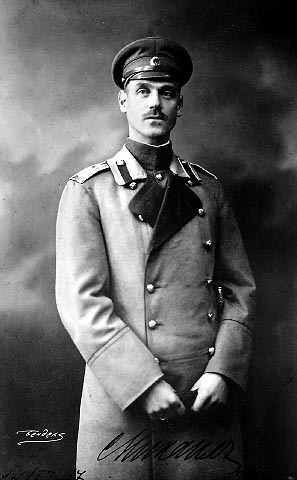 During his sojourn, Alfred Milner held a meeting with prince Lvov, a member of the Duma, at which the possibility of revolution ‘within three weeks’ was specifically discussed. Lloyd George spouted what appeared to be criticism of Milner, but it was part and parcel of the ploy to conceal historical truth. Lloyd George was a political puppet of the Secret Elite, party to its agenda and a willing player. He had sold his soul to the international bankers for power and material riches many years before. Almost three weeks to the day after Milner’s private discussions with Prince Lyoy, the so-called ‘spontaneous revolution’ took place in Petrograd. 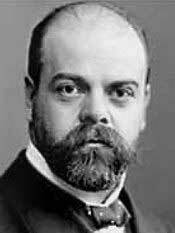 Czar Nicholas subsequently abdicated, and Lvov was installed as prime minister. Yet Milner apparently knew nothing? Untangling the Secret Elite’s web of intrigue during the Russian mission is no simple matter. But be certain of one thing. Alfred Milner was not a man to waste his time, let alone risk U-Boat infested seas to journey to Russia in the depth of winter, unless it was a matter of the gravest importance. It was no coincidence that he was in Petrograd less than three weeks before the revolution exploded. He saw what was happening and he knew what was about to happen. The question of supplying Russia with artillery was most definitely not the reason for the visit. 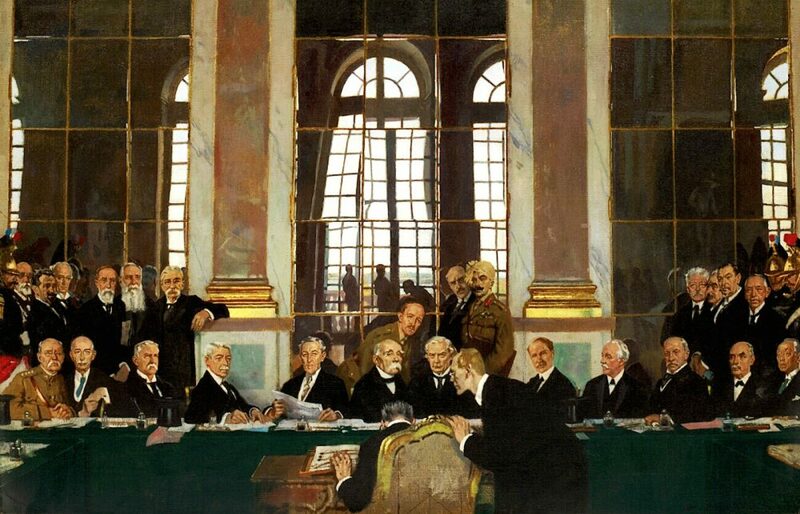 His presence at what was termed an Allied Conference was the perfect cover, for Milner had far more important business. Crucially, at that very time, Secret Elite agents were supplying monetary bribes to workers’ leaders at the giant Putilov factory and to soldiers of the local garrisons. The ground-work for imminent revolution was in motion while Milner was in Petrograd. We know that he had private talks with the Czar, and it is not beyond the realms of possibility that Milner warned Nicholas II that British Intelligence had sound evidence that serious disorder was about to erupt in the capital; disorder which would present an immense threat to the Czar’s personal safety and that of his beloved children. The key objective of this Secret Elite exercise was to manipulate their own agents into power in Russia. Nicholas had served his purpose. Did Milner urge Nicholas to consider abdication with promises that he and his family would find a safe refuge in Britain? The speed with which the Czar abdicated and his lack of fight surprised many. Milner’s involvement is not some far-fetched theory. He was accused in Parliament of making speeches in Russia which went unreported in Britain because of press censorship. The Irish Nationalist leader, John Dillon berated Milner for apparently supporting the Czar’s regime and spouting nonsense in Moscow denying the state of popular agitation in Russia. When he returned to London, Milner was reported in The Times as saying that ‘it was quite wrong to suppose that there is in Russia any controversy about the waging of the war.’  It was of course, nonsense, but such claims served to deflect attention from what was actually happening. Two days later, the revolution began. 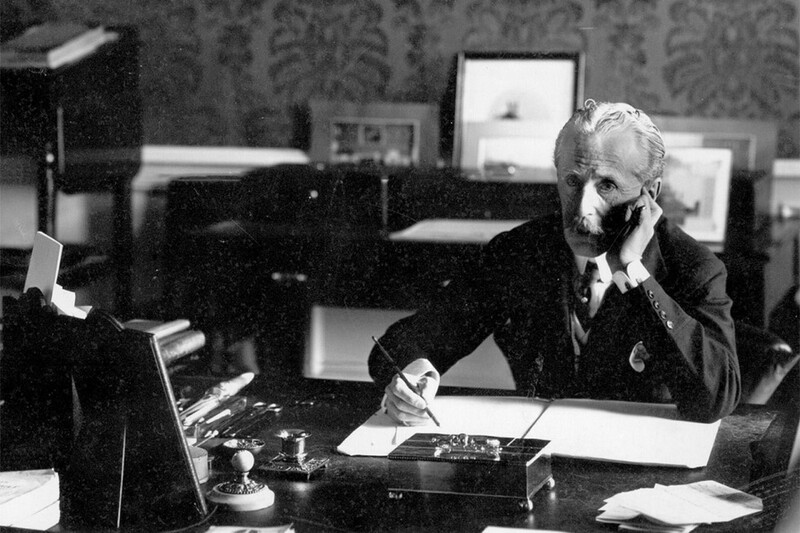 In reply to questions in Parliament on 3 April 1917, Andrew Bonar Law, Chancellor of the Exchequer, and an associate of the secret cabal, stated: ‘I have seen statements emanating from our enemies that it was owing to Lord Milner that the Czar was overthrown.’  What? Milner clearly made unreported speeches and met unreported persons. But what more did the Germans know? Where is the proof that Milner caused the overthrow of the Czar? Yet again we reach an impasse on Milner’s activities. Reports and records were afterwards removed, correspondence burned on his orders and any evidence of his detailed machinations destroyed. Whatever else, Alfred Milner was no innocent aboard. He knew what was going on because, like his Rothschild/Secret Elite friends, he had his finger on the pulse before the heart could beat. If the received history of the First World War was true, why would he turn down the chance to offer Russia materiel support for its massive summer offensive; an offensive that would most likely have shattered the enemy forces on the Eastern Front and brought the war to successful conclusion? Why turn down lucrative bank loans to Russia for weapons, and the substantial profits for British armaments companies which manufactured those weapons? The answer was, as always, Constantinople. The Russians could never be allowed to take possession of Constantinople. While the Czarist authorities there were doing their utmost to dampen the revolutionary flames, the Secret Elite were fanning them. In an article in the New York Times, the explorer, journalist and Russian expert, George Kennan, revealed that in early 1917 Jacob Schiff of Kuhn, Loeb Bank on Wall Street financed Russian revolutionaries through an organisation, the Society of the Friends of Russian Freedom. Indeed, Schiff had financed Russian revolutionaries from at least 1905. 1. National Archives CAB 23/1 War Cabinet 37, 18 January 1917. P.3. 2. R.H. Bruce Lockhart, Memoirs of a British Agent, p. 162. 3. J. Lee Thompson, Forgotten Patriot, p. 335. 4. R.H. Bruce Lockhart, Memoirs of a British Agent, p. 163. 5. CAB/ 24/3/36 Lord Milner’s Memorandum of 13 March, 1917 (G – 131). 6. CAB 23/2 War Cabinet 88. 7. R.H. Bruce Lockhart, Memoirs of a British Agent, pp. 168-169. 8. Lloyd George, War Memoirs vol 1., p. 943. 9. R.H. Bruce Lockhart, Memoirs of a British Agent, pp. 164. 10. Docherty and Macgregor, Hidden History, pp. 161-163. 11. House of Commons Debate 27 March 1917 vol 92 cc295-318. 12. The Times, 6 March 1917, p. 6. <13. House of Commons Debate 03 April 1917 vol 92 c1120. 14 New York Times, March 24, 1917. 15. Preparata, Conjuring Hitler, pp 28-29. 16. G. Edward Griffin, The Creature from Jekyll Island, p. 274. 17. The Round Table was an influential think-tank pressure group which was built around Alfred Milner and his acolytes. Its prime aim was to spread his ideas of expanding the Empire to encompass the entire world. 18. 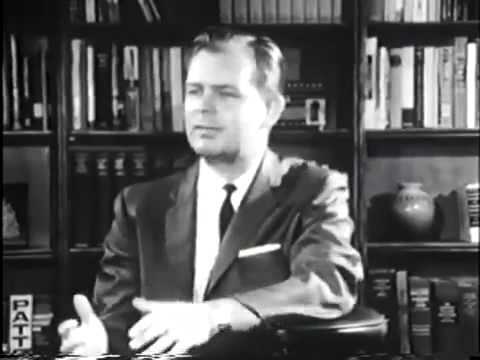 G. Edward Griffin, The Creature from Jekyll Island, p. 274. Russia’s hopes for victory over Germany were dashed early. 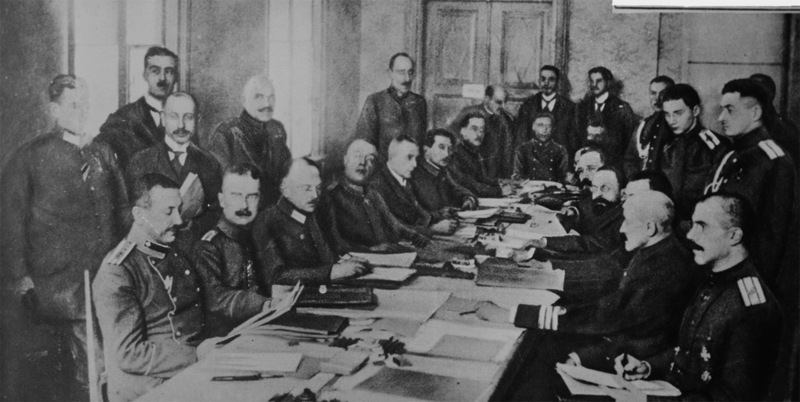 At Tannenberg and the First Battle of the Masurian Lakes, in 1914, the Czar lost two entire armies of over 250,000 troops. 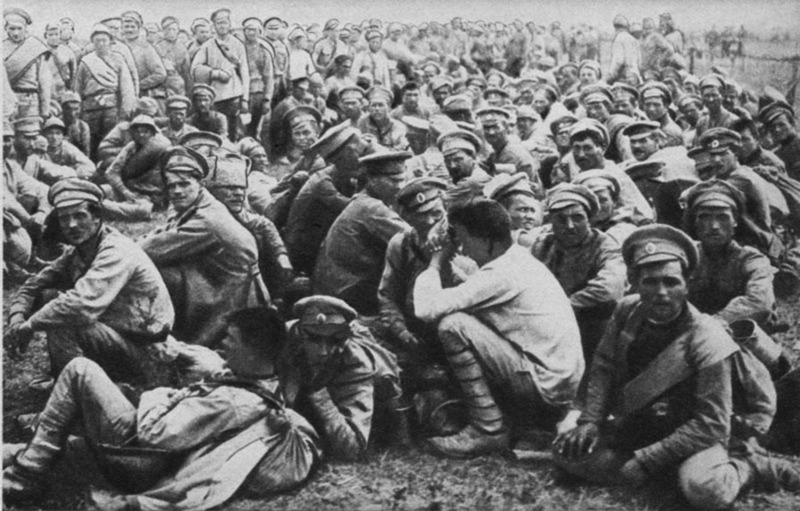 Although the Russian advance into East Prussia disrupted the German plan of attack and impacted on, or indeed prevented the fall of Paris on the Western Front, it also signalled the beginning of an unrelenting Russian retreat on the Eastern Front. By the middle of 1915 all of Russian Poland and Lithuania, and most of Latvia, were overrun by the German army. Fortunately for the Russians, their performance on the field of battle improved in 1916. The supply of rifles and artillery shells to the Eastern Front had been markedly improved, and in June 1916, Russia achieved significant victories over the Austrians and the Turks. However, the country’s political and economic problems were greatly exacerbated by the war. Many factors – including the militarisation of industry and crises in food supply – threatened disaster on the home front. But where were the leaders of the revolution? After war had been declared, all opposition was clamped down. In the early months of fighting, five Soviet Deputies and other members of the Duma who condemned the war, were arrested and exiled in Siberia. Pravda was suppressed and the central Bolshevik organisation in Russia was virtually broken by the authorities. Local bolshevik groups inside Russia continued surreptitious propaganda, but communications with Lenin and the central committee in Switzerland were intermittent and dangerous. Lenin was resident in Vienna when the war began, but moved to the comfort and safety of neutral Switzerland where he wrote, watched and waited. The Bolshevik movement was relatively quiescent because so many leading members were either exiled abroad or had been sent to Siberia. Lenin’s small émigré cabal held a conference in Berne and called on all armies to turn their weapons ‘not against brothers and the hired slaves of other countries, but against the reactionary and Bourgeois governments of all countries’. 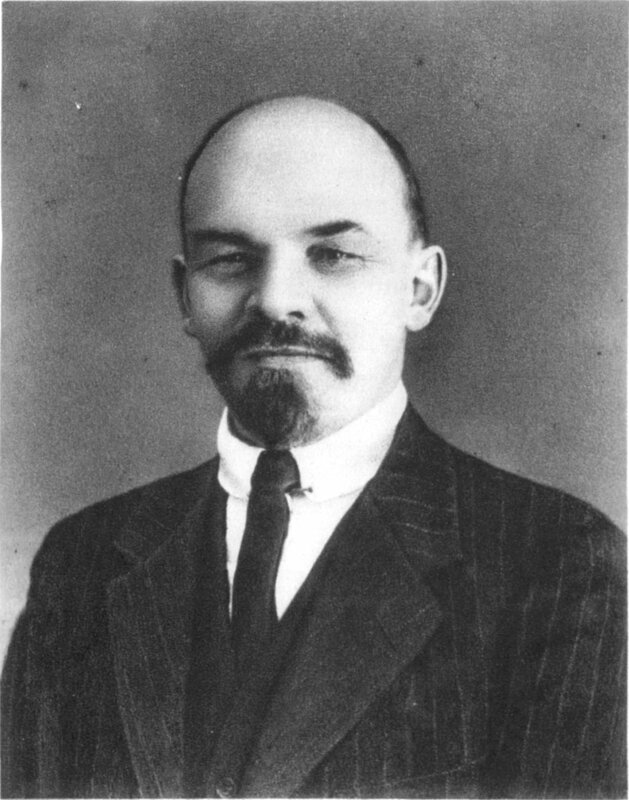 Communication with Russia was slow, but Lenin gained a growing impression that ‘an earthquake’ was approaching because of the hardships imposed by war and the strain of constant defeats. Here begins a remarkable story, largely drawn from Leon Trotsky’s autobiography. A mysterious benefactor arranged Trotsky’s release from jail in Madrid and his transfer, under police supervision, to the southern port of Cadiz. There he waited for another six weeks. On 24 November, Trotsky wrote a long and revealing letter to his comrade Moisei Uritskii in Copenhagen in which he confessed that when he arrived in Cadiz he had roughly 40 francs in his pocket. Somehow, the Trotsky–Uritskii letter fell into the hands of the British Secret Service. British intelligence, under the control of the admiralty’s Naval Intelligence Division (NID), headed by Admiral William Reginald ‘Blinker’ Hall  watched his every move. 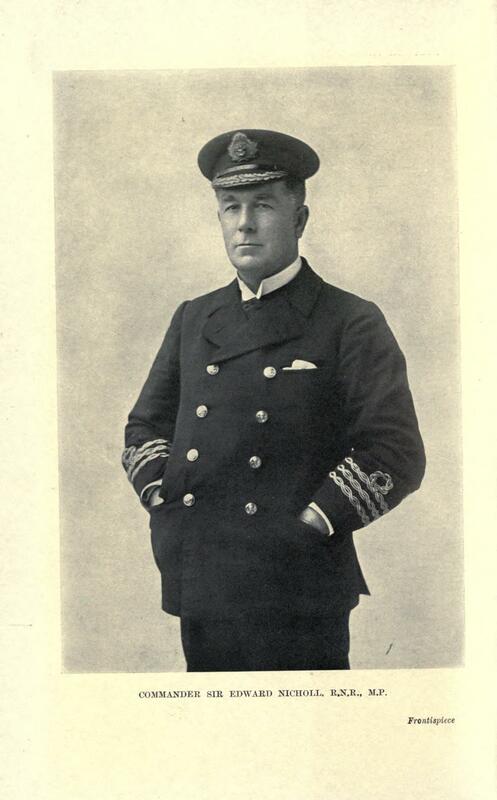 Hall played a central role for the Secret Elite inside the admiralty and amongst his dubious achievements he manoeuvred the Lusitania into the jaws of a German U-Boat off the south coast of Ireland in 1915 and monitored communications between the American embassy in London and Washington. 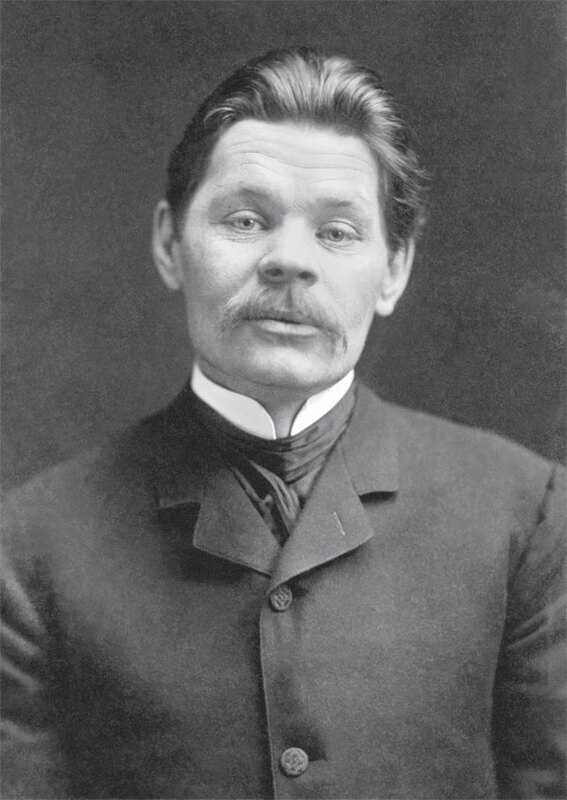 [See Blog] But who was Moisei Uritskii? 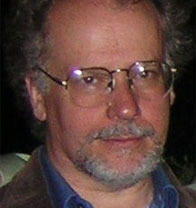 A Russian lawyer, Uritskii was a member of the Jewish socialist party, the Labour Bund, and spent a period of time in exile. 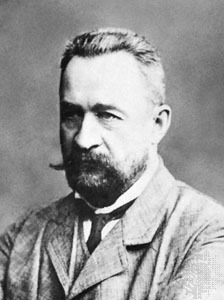 After the Bolsheviks seized power, Uritskii was installed as head of the Petrograd division of the feared Bolshevik secret police, the Cheka, and directly responsible for the torture and death of many innocents. 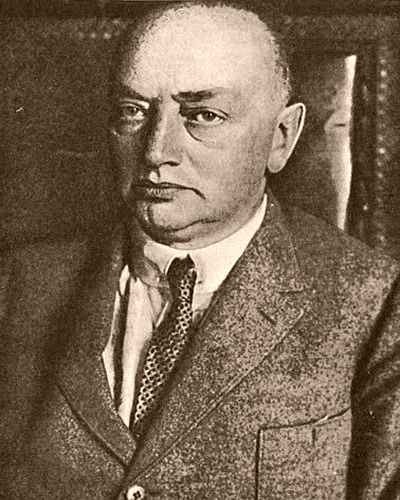 In Copenhagen, Moisei Uritskii was closely associated with another revolutionary plotter, Alexander Israel Helphand-Parvus,’  yet another very important player in Secret Elite intrigues. These connections cannot be explained by chance. 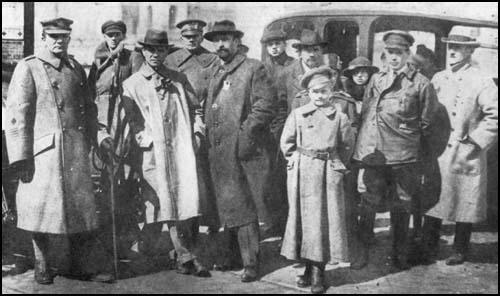 After a relaxing stay in Cadiz, Trotsky was taken to Barcelona to be ‘deported’ to New York. Why Barcelona? Cadiz was an equally important seaport with closer connections to New York. According to Trotsky, ‘I managed to get permission to go there to meet my family.’  Trotsky’s second wife, Natalia, and their two sons were brought by ‘special arrangement’ from Paris to join him in Barcelona where they were taken on tourist trips by the detectives. From whom did he obtain special ‘permission’? This was not the normal sequence of events; first class prison cell, hotels in Cadiz and Barcelona, sightseeing with his detectives? The man was not being treated as an ‘undesirable alien’. He and his family were being pampered. At Barcelona, on Christmas Day 1916, they boarded the Spanish passenger ship, Monserrat to New York. Immigration Service archives relating to foreign nationals arriving at Ellis Island in 1916 indicated that the Trotsky family travelled first class to New York. Moreover, information collected by American immigration showed that the fares had been purchased for him not by him. But by whom? A fellow passenger, one of the very few with whom Trotsky engaged, was the light-heavyweight prize fighter, Arthur Cravan who had been defeated in a world title fight in Barcelona in front of a crowd of 30,000. 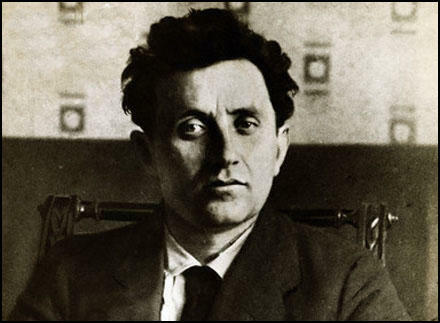 The purpose behind Cravan’s journey is unknown, but the intriguing possibility has been raised that he was a British agent sent to glean as much information as he could from Trotsky. 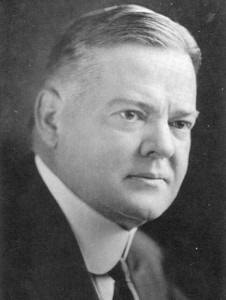 On arrival in New York he would have reported to Sir William Wiseman, head of British Intelligence in the United States. There is the additional possibility that the tall, powerfully built, Cravan served as Trotsky’s personal bodyguard. This is not as fanciful as it might first appear. He had clearly been exceptionally well protected by plain clothes police officers throughout his time in Spain. Trotsky’s expected arrival in the United States had been published in the American press at the very time anti-German propaganda and pro-war jingoism moved into overdrive. The international bankers who were to use him as one of their major pawns in their Russian intervention wanted no mishap to befall a key player before the game had even started. Monserrat arrived in New York late at night on January 13, 1917. The passenger manifest prepared for the U.S. immigration authorities showed that Trotsky was carrying at least $500 (an equivalent of $10,000 today). His initial residence was given as the exclusive Astor Hotel, the favoured haunt of the banking and financial elites when in New York. The reservation had been made for him by persons as yet unknown. Trotsky failed to record in his autobiography that he and his family stayed at the Astor, but related how he ‘rented’ an apartment in a ‘workers district’, paying three month’s rent in advance. 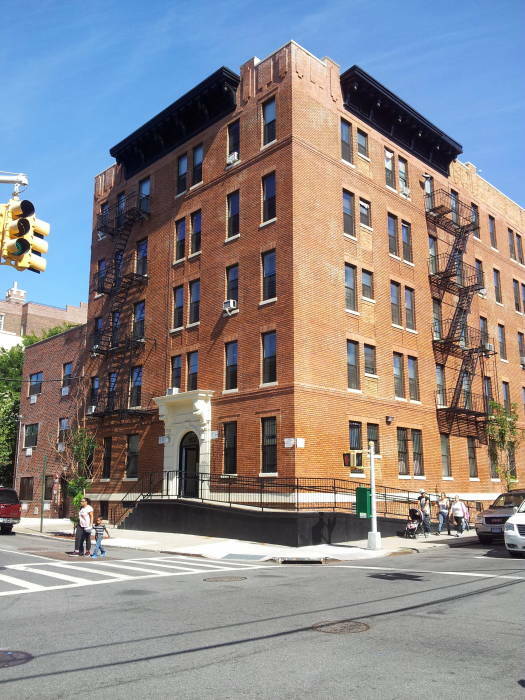 The apartment, on Vyse Avenue in the Bronx, had every convenience, including ‘a gas cooking range, bath, telephone, automatic service elevator and a chute for garbage.’  There was even a concierge. Perhaps most astonishingly, the family used a chauffeured limousine. 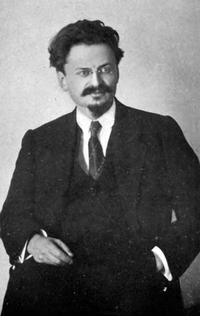 Trotsky, the ‘impoverished, undesirable’ revolutionary, had enjoyed a first-class cell in Madrid; stayed at upmarket hotels in Cadiz then Barcelona for six weeks; went on guided tours with his family; travelled first-class on a 13 day voyage to New York; stayed at a luxury hotel before renting an excellent apartment in New York and enjoyed stylish living standards and a chauffeur. How? In stark contrast to his immense good fortune, concurrent events in Russia precipitated disaster. 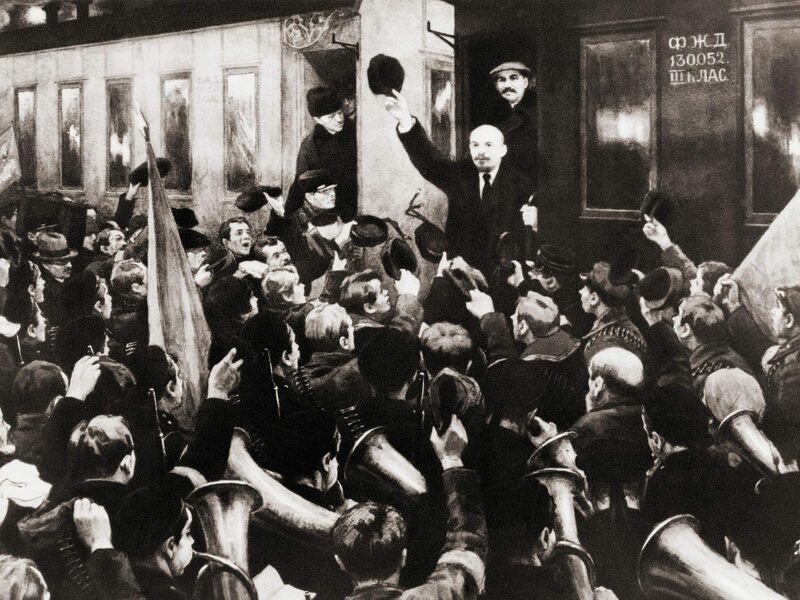 While Trotsky luxuriated in New York, revolution exploded on the streets of St Petersburg. Odd that Trotsky and Lenin were comfortably moth-balled outwith the danger zone, leaders-in-waiting, supported and protected by un-named persons. The Czar and military authorities recognised that civilian discontent was once again rampant throughout the country. They were likewise acutely aware ‘that gigantic forces were at work fomenting a revolutionary movement on an unprecedented scale.’  In late December 1916 the highly controversial Russian faith healer, Grigori Rasputin, was brutally murdered. The Czarina had fallen completely under Rasputin’s influence in 1907 when she believed he had the power to save her haemophiliac son. Alarm bells rang in the hidden corridors of power. The secret cabal in London no longer had any need for a massive Russian offensive to win the war. They knew, from the earliest days of 1915, that victory was certain once supplies of food, oil, minerals, gun cotton and the wherewithal to produce munitions in Germany, were stopped. But the war had to be prolonged almost beyond endurance to crush Germany. That was at all times the primary objective. April 1917 saw America abandon her sham neutrality and enter the fray. Fresh blood from across the Atlantic would help replace the millions still being haemorrhaged on the Western Front. Russia had more or less served her purpose. The Americans were coming. The Secret Elite had promised the Czar that Russia would be given Constantinople as a just reward for the Russian war effort, but were determined that it would never come to pass. 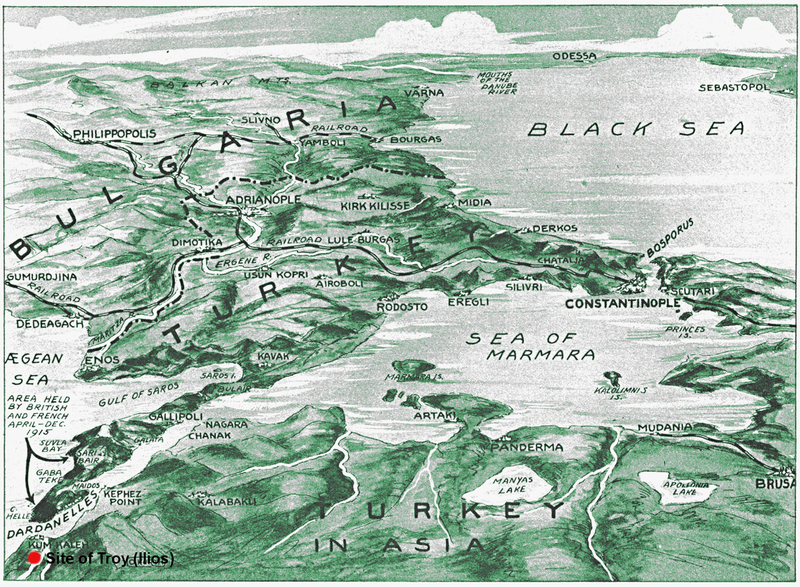 Although the Allies had sacrificed a quarter of a million men on the Dardanelles and Gallipoli campaigns, as explained earlier, these were deliberately set to fail in order to keep Russia involved in the war but out of Constantinople. In 1915 such action was critically important. Two years on, circumstances had radically changed. 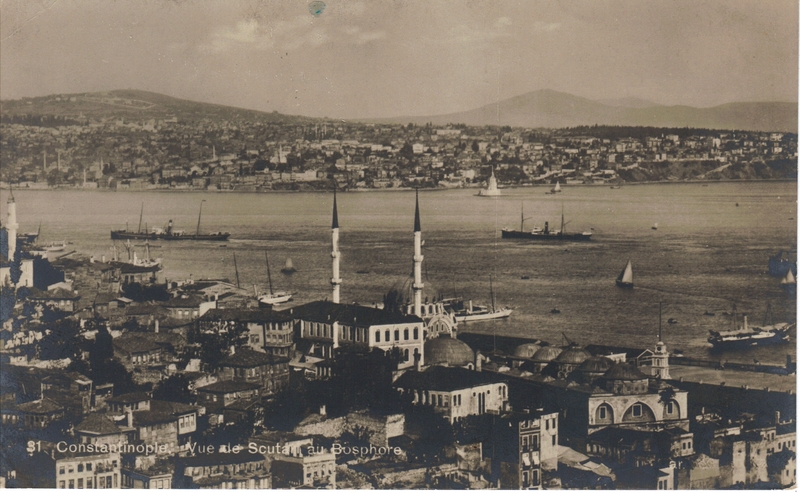 The Secret Elite would certainly not allow Russia to take possession of the Ottoman capital in 1917 through a major offensive that might end the war. They intended to carve up the Ottoman Empire for themselves, and Russia would not be permitted to interfere. Further steps had to be taken to ensure Russian failure. If that caused a consequent regime change, so be it. There was no love for the Romanovs in the foreign office. The Secret Elite had to ensure that a possible future rival for key parts of the Turkish Empire, the oil-rich sands of Persia or the vital trading routes to India was removed. Permanently. 2. Carr, The Bolshevik Revolution, p. 66. 4. Leon Trotsky, My Life, An Attempt at an Autobiography. 7. Trotsky, My Life, p. 267. 8. 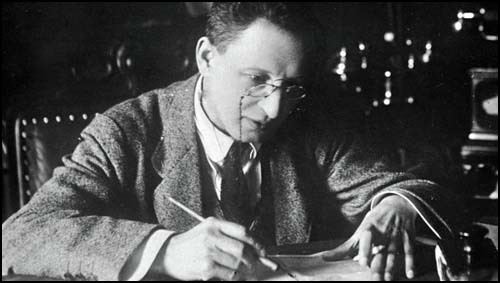 Richard B. Spence, Hidden Agendas; Spies, Lies and Intrigue surrounding Trotsky’s American visit of January-April 1917. 12. Boris L. Brasol, The World at the Crossroads, p. 58.